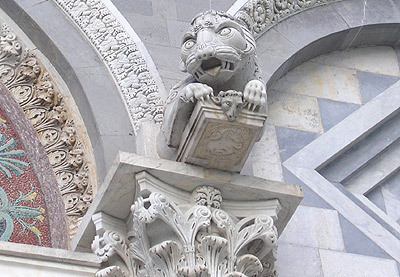 During the powerful economic and political centuries of the Marine Republic, art in Pisa was particularly flourishing, above all, in the areas of sculpture and architecture; marking in certain cases, the change from Romanesque to the new Gothic forms, but still with characteristics showing influences of various origins; from classical to oriental. The Cathedral Square, known as the Square of Miracles, is rightly renowned: on its ample and grassy areas (a 19th Century choice), we can find the Cathedral (1063-12th Century), which preserves the Pulpit by Giovanni Pisano (1302-10), the Bell Tower (the famous leaning tower, 1173), the Baptistery (1152-14th Century), containing decorative motifs on its exterior, already orientated towards the Gothic style and which in its interior, houses the Pulpit by Nicola Pisano (1260), the Camposanto (Monumental Cemetery) (1278-83), heavily damaged by artillery fire in 1944, but brought back to its original appearance after long and detailed restoration to the present day, definitive layout. The Square of Miracles, is a symbol of the power of Pisa during the medieval era, both for its grandiose monuments (the Cathedral has five naves), as well as for their artistic qualities: the choice of marble, the refinement of the little loggias, the attention to particulars, the search to create harmony between one building and another, the works chosen for their decorations, which represent in some way, an anthology of Italian medieval sculpture. A special note, awaits the Bell Tower of the Cathedral, well known as the Tower of Pisa or Leaning Tower. It is cylindrical in shape, and of Romanesque style, consisting of six loggia arrangements, surmounted by a belfry cell. 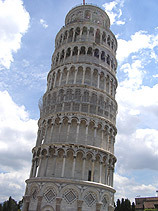 Initiated in 1173 by Bonanno Pisano, but interrupted half way through because of its height, due to the incipient inclination; restarted in 1275 by Giovanni di Simone, and terminated in 1372 by Tommaso di Andrea di Pontedera, who still however, kept it lower in respect to the original project. Work continued due to a slow accentuation of its incline, necessitating a radical intervention (1991), needed to stabilize its foundations; concluding successfully in 2003 (from this moment on, thanks to modern technology, the progressive inclination has been practically blocked, or almost completely slowed down and the “state” of the Tower is constantly monitored).